I’m still rather reluctant to share this recipe with you. Most things I share on the blog are things that have worked out for me; actually, this goes for all things I have posted on the blog. I’m by no means an expert chef, you know that, but my reasoning is, if it works for me then it will most certainly work for you. And so a recipe gets posted. So why then am I sharing this recipe that has dismally failed on me, with you? I'm not exactly sure why, I think that cruel, self-deprecating part of me just wants to lay my shortcomings out on the table. One of those flaws is that I'm hopeless at savoury foods. I have my moments here and there, but as a whole, I'm a little lacking when it comes to dishes that don't contain sugar. So now that the truth is out in the open for everyone to gawk and snigger at, let me share with you my grim rendition of what I suppose was a perfectly delectable recipe for cornmeal and shallot madeleines. 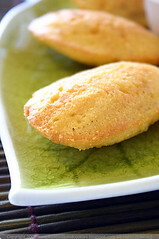 I saw the words cornmeal and madeleines and thought what an interesting take in making madeleines with cornmeal. It certainly piqued my curiosity and when I discovered that I had all the ingredients on hand, including a tub of Gympie Farm crème fraîche from the farmer's markets, I was even more stirred to give it a go. Casting all my savoury food failings aside I embarked upon this recipe with all hope that it would turn out a treat. And while I was following the instructions to the letter, I had every inkling that it would be successful. After all I was using great ingredients and all I needed to do was execute the recipe as instructed. Right? Hmm, I don't know exactly where the train-wreck ensued, probably somewhere between putting the madeleines into the oven and then taking them out. They looked all right and the smelled okay, but they tasted almost like feet- crunchy yellow, onion-scented feet. I realise that many of you probably came here to be swept up by some delicious dish that incites drool to drip from the corners your mouth, but I guess this time I fail you. So the madeleines didn't exactly taste like feet, they tasted quite buttery in fact. But aside from it's distinct onion smell, there was a slight scent of feet. I'm not exactly sure, but I imagine that your olfactory senses have a lot to do with your sense of taste, so the fact that the madeleines smelled somewhat of feet, made it seem like it tasted like feet. It almost feels inappropriate to be speaking about such a charming thing as a madeleine but sometimes you just have to call it as it is. I must point out that the madeleines weren't a complete failure; some people did enjoy then, although some of those people included my mother, so she probably doesn't count. And when you have a glass of wine to wash it down with, you really can't tell the difference between onions and smelly feel, can you? And if you can still tell the difference, then it’s probably indication that you need to take another swig from your wine glass. If this recipe, even after being likened to feet, still wets your appetite then by all means give it a go and let me know if you have a better result. I would be very interested to know. I had such high hopes for it that I am fairly certain that it is more likely human error that caused the slight tang of feet, rather than the recipe itself. I guess my only advice to heed is that don't serve it to guests before trying it yourself. Luckily this was only served to my hapless family who grinned and bore it through to the last mouthful. Coming up next: Madeleines that don't reek of feet. In a skillet cook the shallot in 1 tbsp of the butter over moderately low heat, stirring, until it is softened and let the mixture cool completely. In a bowl stir together the cornmeal, the flour, the baking powder, and the shallot mixture, add the remaining 1 tbsp butter, cut into bits, and blend the mixture until it resembles fine meal. Stir in the egg, the crème fraîche, the water, and salt and pepper to taste and stir the batter until it is combined well. Preheat a 12-hole madeleine tray in the middle of preheated oven for 2 minutes, remove the tins from the oven and into each hole spoon a heaping 2 tsp of the batter. Bake the madeleines for 6 to 8 minutes, or until edges are brown. Turn them out onto a wire rack, and let them cool completely. Top the madeleines with the additional crème fraîche. NOTE: The madeleines may be made 3 days in advance and kept chilled in an airtight container. 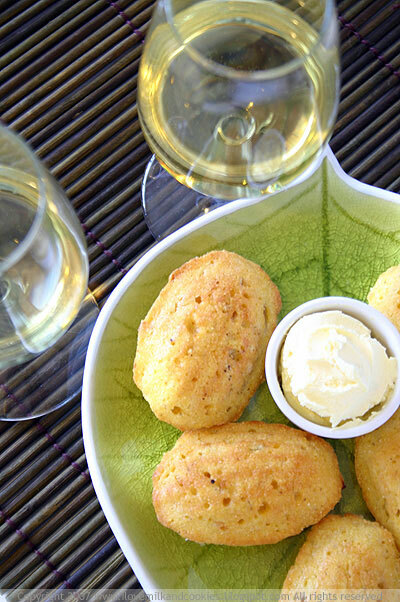 Savory madeleines? Thats a brilliant idea. The ingredients speak for themselves. Bookmarked! Great idea, I never thought to make them savory. u r probably your own worst critic! What a bummer! 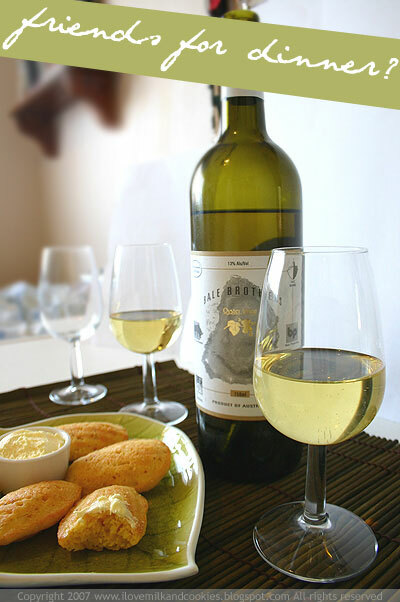 I sometimes think wine smells like gym socks, so maybe the madeleines were just trying to make the wine feel better? I think I'll pass on this one, you can strike back with the greatness of sugar! Ops pardon my dutch, but here I got something similar a few times. You know, dutch are irrespective inthe kitchen with lot of fantasy. Anyway, if you have time ... I have mentioned you to a very simple and impersonal meme. 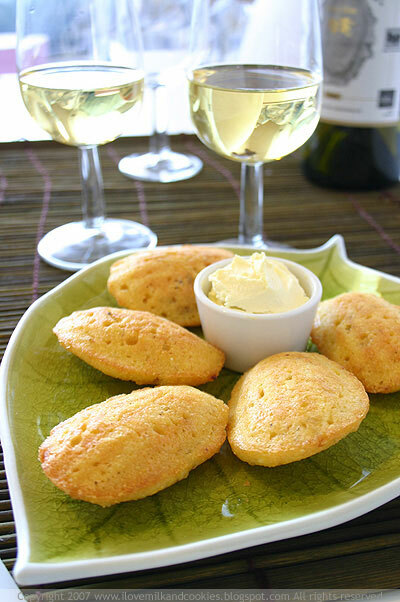 I have never tried savory madeleines, Jenjen - these are beautiful! Might have been the polenta. If this is an American recipe that called for cornmeal, then Australian polenta is not the same thing. 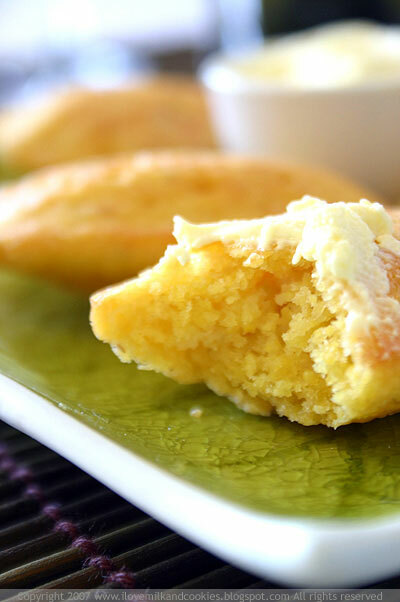 The grade of cornmeal that is used as a baking ingredient in the States is much finer. American cornmeal is generally used in things like corn tortillas and American style cornbread, and if you try to make those with polenta, you will not get the same results. You can often find cornmeal in Sydney, depending on what's in stock at the Essential Ingredient or David Jones. They look very tasty though! I want to make this recipe - I recently made bread with cheese and spring onions and it was divine - never thought onions could taste so good in baking! One of my friends calls parmesan cheese, toenail cheese - probably the same smell that put you off these. Great photos and you can 't smell the feet. I have to take savouries to a party on Friday and I might just get game and give them a try. 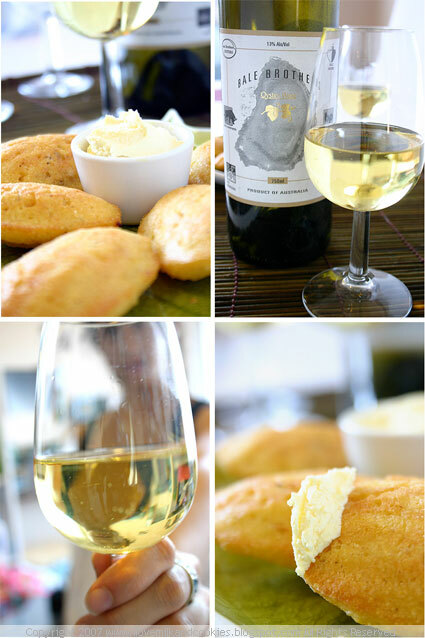 Those look so good, especially with the wine! Your writing's got me giggling. Sorry that they didn't turn out right! Myself, I am very picky about food smells. I simply can't eat fresh gruyere for that reason (if it's hidden or cooked in something that's fine) - it smells truly awful to me. That and mangoes. Weird, I know, but try smelling a mango sometime!! When I saw your post title, I was like: /I hope the feet and madeleines are unrelated/. Haha...I'm sure they weren't that bad...the recipe does sound intriguing though! ooh but they look so good, hard to believe they would be all feety!! Those look incredible. I really need to buy a madeleine pan. One Thanksgiving when I was a kid, my grandmother made rolls that smelled and tasted like feet...every year after that, my cousins and I would only eat the rolls if we could convince ourselves that we smelled feet. (I know, but I was just a kid...) So maybe I'll try these for my own kids! Oh dear. Feet biscuits? LOL. It's very nice of you to share your cooking disaster like this, and we never would have been able to tell from the lovely photos. Congratulations on your weblog award nomination by the way. I visit your blog regularly and really enjoy it. Ciao, sono Gialla... ho appena creato un foodblog e mi sono permessa di mettere il link al tuo, mi piace molto il tuo blog, passa a trovarmi anche per scambiarci tanti consigli, ancora non ho messo un granchè ma prometto che presto sarà pieno di ricette sfiziose. Feet..lol that gave me a good laugh:) Your photo's are so beautiful however, I"d be tempted to try this recipe inspite of the foot smell! The juxtaposition of "madelines" and "feet" was a brilliant visual, I'm still cracking up thinking about it. The pictures are very lovely, however! I'm almost -- almost -- tempted to give it a go (but the feet smell is too strong of an image, lol). I couldn't stop smiling to myself how you describe your madelines. Now I wonder how feet smell like. Nevertheless, feet or not feet, still looks good. These photos look like my idea of heaven. what a brilliant idea for madeleines! will def try these ones out ... I did a post on Donna Hay's chocolate madeleines a couple of weeks ago ... so addictive! !